Heat oven to 375°F. Lightly spray 12 regular-size muffin cups and top of pan with Crisco® Original No-Stick Cooking Spray. In 2-cup microwavable measuring cup, stir jelly, brown sugar and mustard until well blended. Microwave on High 1 minute. Stir until smooth. Microwave 15 seconds longer or until syrupy. Pour into shallow microwavable dish. Unroll dough; carefully separate into breadsticks. Press breadsticks to length of bacon slices. 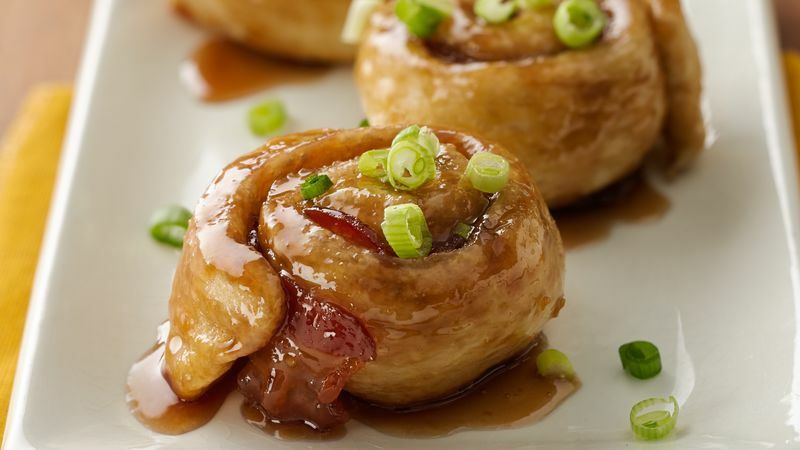 For each rollup, dip 1 bacon slice in syrup mixture, turning to coat both sides; shake off excess. Place on breadstick. Starting at one short end, roll up; place in muffin cup, flat side up. Repeat with remaining breadsticks and bacon slices. If syrup mixture thickens, microwave on High 10 seconds; stir. Bake 10 to 13 minutes or until rollups are puffed and light golden brown. Invert muffin pan onto heatproof platter, allowing syrup to drip down sides of rollups. Sprinkle with sliced green onions. Serve warm.